We report two cases of pneumatosis intestinalis and hepatic portal venous gas. 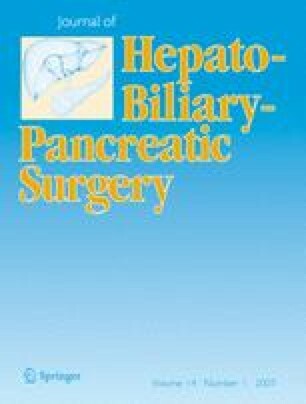 The first case was in a 67-year-old woman who complained of strong right lower abdominal pain and high fever on the twelfth day after pancreatoduodenectomy (PD) with portal vein (PV) resection. Abdominal X-ray and computed tomography showed hepatic portal venous gas and pneumatosis intestinalis. The emergency laparotomy performed disclosed extensive necrosis of the bowel from the jejunum to the ascending colon. All necrotic parts of the bowel were resected and a jejunostomy was performed. The residual intact small intestine was 30 cm in length. Her postoperative course was stable. This is a rare complication after PD and cannot be cured by any other treatment but surgery. The second case was in a 45-year-old woman with the chief complaint of abdominal pain and constipation. She had a past history of chronic toluene inhalation. Abdominal X-ray and computed tomography also showed hepatic portal venous gas and pneumatosis intestinalis, as well as free air, but no physical examination or laboratory test results supported a diagnosis of bowel necrosis. Hyperbaric oxygen (HBO) therapy effectively controlled the symptoms and signs.